This week marks the 70th anniversary of the Vel d'Hiv roundup, in which 13,000 French Jews were herded into a Paris cycling stadium -- formally known as the Vélodrome d'Hiver -- by French police acting on Nazi orders. Thousands of Jews were held for several days and eventually deported to Auschwitz. The 1942 roundup, which occurred on July 16 and 17, has long been a stain in France’s World War II history. The French authorities did not acknowledge their role in the arrest and deportation of the Jews until 1995, when then-French president, Jacques Chirac, gave a speech claiming France's responsibility in events. In light of the anniversary, The Huffington Post caught up with 82-year-old French Holocaust survivor Cecile Widerman Kaufer, author of Goodbye For Always: The Triumph Of The Innocents. Widerman Kaufer and her younger sister escaped from the Paris stadium and subsequently went into hiding in Normandy, France. The two Widerman sisters are believed to be among the few children to have survived the Vel d’Hiv roundup. Tell us what happened in July 1942 in Paris. I was 11-years-old when the Nazis invaded France. As one of three daughters to a Polish immigrant family living in Paris, we immediately felt the Nazi occupation as I was required to wear a Jewish star. But on July 12, 1942 at 3 a.m., our lives changed forever. Soldiers banged on our door loudly, pointed guns at our heads and forced us to leave our apartment. Packing only a few belongings, we walked miles until we reached a truck depot. Hours later, my family and thousands of Jews were crammed on to trucks and driven to the Paris sports stadium where we spent several days without food and water. The smell was horrific. No one knew what was going on. How did you manage to escape the Vel d'Hiv stadium and later the hospital? My father convinced a French guard to let our family stay together because my mother was ill from tuberculosis. Days later, two French guards let my younger sister, Betty and I go with our mother to the hospital and leave the stadium. That was the last time we saw our father and older sister. While at the hospital, I convinced a woman to pass a note on to my grandparents letting them know where we were. Next, we persuaded a French guard to let us free from the hospital, while my grandparents arranged for my sister and I to be taken into hiding by a Catholic French woman from Normandy who was already hiding five Jewish children. We called her Memere, which means grandmother in French. What was it like living in hiding all of those years? Like the thousands of other hidden children, we went for days without food. I was scared all the time and worried constantly about caring for my little sister. But I promised my mother I’d take care of her. And I still take care of her. How does the 1942 Vel d’Hiv roundup stand out from the entire Holocaust? To me, it marked the beginning. No one understood what was happening at that time. Thousands of people locked in that tremendous place. Every July, my stomach churns from the memory. 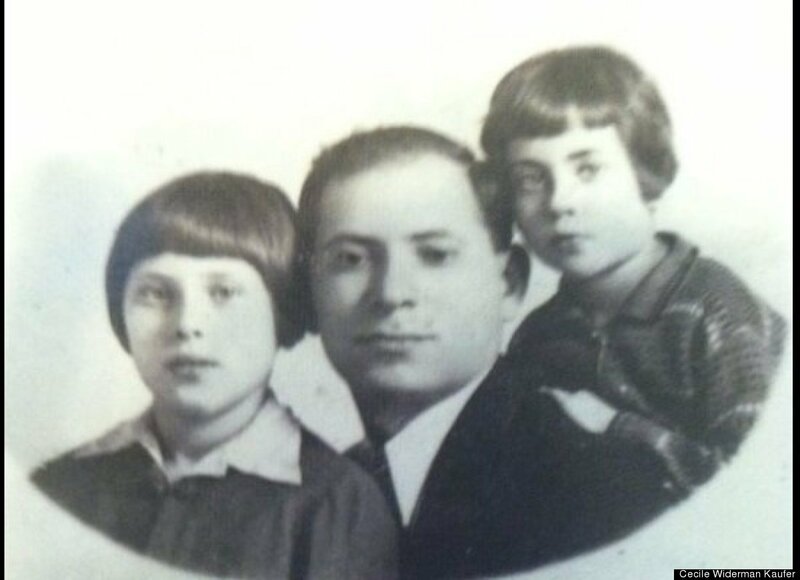 From 1946, you began writing to the French government to find out about your parents. Tell me about that correspondence. For years after the war I didn’t know what had happened to my parents. I had no idea about the death camps at the time. Deep down I always believed my parents and my older sister fled to Israel and it was only a matter of time before we found each other. It wasn’t until 1962 that the French government finally wrote to me and told me the truth: The entire Widerman family perished in Auschwitz. Prior to that, I’d only received letters saying “Ils sont disparus”, which means "They are lost". To this day I always feel guilty that I survived. Have you been back to Paris since? I went back to France many times to visit my friends from the orphanage. But the first time I returned was in 1963 when Memere was dying. She told me "I've been waiting for you, Cecile. Now I can die in peace that I saw you." Two weeks later, she passed away. With the 70th anniversary this week, do you harbor any resentment toward the French government over the Vel d’Hiv roundup? France was to blame, yes. But not all were to blame. We had many French people save my sister and I all along the way. The two French guards who let my sister and I go to the hospital with our sick mother and leave the Vel d'Hiv; the man at the hospital who let my grandparents take us away. And then, of course, Memere, the Christian woman who kept us in hiding and risked her life many times over. For almost 50 years you didn’t speak a word about the Holocaust. What prompted you to revisit your past? In 1991, I attended the 'First International Gathering of Children Hidden During World War II' at a hotel in New York. Hidden children came from all over the world to the conference. A room was devoted to each country for hidden children. At the end of the day, in the French room, I managed to find a close friend from the Paris orphanage who I lived with after the war. She'd changed her name from Sarah to Suzanne--she'd never received any of my letters. Later I visited her in Paris and today we still remain close. How and when did you begin to write your story? I started to write about my experience from age 12 while in hiding in Normandy. Everyday I would write a diary in French of what happened. Later when I came to the United States, where my sister and I were fostered by a Jewish doctor in New York, I began translating the French manuscript into English. It wasn’t until many years later that the book was finally published. Did you have any reservations about publishing your memoir? I never wanted to publish my story in the first place. I wanted to keep it in my heart. It was my hurt. I didn’t even want my children to know--I wanted to protect them. Finally, I changed my mind and realized how important it was to tell my story, and in 1997 Goodbye For Always: The Triumph Of The Innocents was finally published. Finally, what do you hope readers would take away from your survival tale? I want people to know my family. By publishing this book, my parents and sister will live forever. See more photos of Holocaust survivor Cecile Widerman Kaufer below. Marguerite, Herz and Cecile Widerman in 1934. The photo was originally captioned in Hebrew, however Memere erased the lettering while Cecile and Betty were hiding in Normandy to prevent the Nazis from discovering they were Jews.